A few of the answers received to the question: what is your couch memory? There was this really funky smell in our apartment and for years we couldn’t figure out what it was until we found a loaf of mouldy bread down the side of the couch, which, by then, had turned into a bag of dusty mould. I GOT SOME CHEWING GUM STUCK IN OUR FLUFFY 1970’s COUCH AND COULD *NOT* GET IT OUT. I WORRIED MY MUM WOULD HAVE A FIT SO I TRIED TO HIDE IT AND FOR A LONG TIME SHE DIDN’T NOTICE, BUT WHEN SHE FINALLY SAW IT, ALL SHE DID WAS CUT IT OUT AND WE LIVED WITH THIS BIG HOLE UNTIL WE BOUGHT A NEW COUCH YEARS LATER. Walking around the McGill ghetto taking other people’s trash as treasures. We find a leather couch. Once we sit down on it we don’t want to get up. So comfortable!! The couch is in our home now, saved from the curb, ready for a new life! I used to hide underneath the cushions on the couch and see if I could actually get someone to sit on me. I sat on a couch once. Never again. Spitting out my Flintstones vitamins behind the couch. I remember my parents black and orange davenport. My dad still has his LaZBoy armchair some forty years later. Sitting on the living room couch. Rarely used. In the dark, with my first boyfriend… listening to my dad fart as he sits on the floor in his room above us. I had a favourite armchair. Now my mother-in-law has it. I’m a bit bitter about it. I want it back! My boyfriend Michael had two couches when I met him. One was black leather, torn and covered with blankets. It had been the stage of many sexual encounters and had suffered because of it. When we moved in together I made him throw it out. But getting rid of the memento (or scene of the crimes) didn’t help me get over the stories. I could never shake them and we broke up a year later. At 14 years old I fell in love with my dad’s couch. I’ve been sleeping on it in the basement now for two years. My family has never paid for a set of couches in our lives. The latest set has been my bed for the past year or so, so that I don’t wake my mom up with my 5 a.m. alarms. I took over her spot. She spent 5 years sleeping on our last set of couches after she had her lung out, but she still never slept more than 20-40 minutes a night. I was sitting on my couch in my basement and I turned my head only to find a spider inches away from my face. I haven’t sat on that couch since. At my grandma’s old house there was this big floral orange couch, very uncomfortable, and I was sitting on the back of it and the couch tipped over on me and my cousins laughed for hours. It was pretty amusing actually. Being sick as a kid, sick enough to stay home from school and having a bed made on the couch so I could watch TV. Sitting on the Queen streetcar with my friend. She spots a vinyl couch in a store window, buys it, brings it home and we call it the puke and wipe. When I was about thirteen my dog jumped up on the couch beside me and sat in my bowl of ice cream. Watching The Twilight Zone with my mother when I was about 10 or so. Scared to death, but feeling protected because I was curled up next to her on the couch. So I was actually safe from the monsters … until I realized she was snoring. I have a re-upholstered chair that belonged to my great-grandmother. I can still see myself sitting on her knee as she talked to me. I’m so honoured to own it. She’d sing and clap her hands with her arms around my waist and bounce her knee. I also remember all of her great-grandchildren gathering around that same chair while she read to us. If only that chair could talk. She passed away when I was 13. She was 99. She didn’t want to be 100, didn’t want ‘all the fuss’. She made uniforms for WWI, wrote in a diary every day, said it kept her sharp. Every family photo EVER taken was taken on the couch. My sister and I would lie on separate couches in the same room, watch TV and talk to each other during commercials. It was the only time we really talked to each other. To make us behave, my mother would tell us she was a witch and that her broomstick was hidden behind the couch. We were too scared to check. I remember sitting on the couch with my dad, listening to the great records he’d picked up in New York City. We had an old armchair, burgundy velour with carved legs, that was so deep my eight-year-old self felt like I was inside a cave. I ate peanut butter with a tablespoon, straight from the jar, while watching cartoons. I ate the whole jar. Didn’t touch peanut butter again until my late forties. We have only kicked one couch to the sidewalk — a lovely leather and velour job with a matching chair from our den . It had previously been in my parents’ den for over thirty years. We’d no sooner gotten the two items to the curb when a pick-up truck skidded to a stop behind us and two university boys asked if they could have them to furnish their apartment. The chair and couch were still in pretty good condition after about fifty years, and apparently were destined for more years of service! 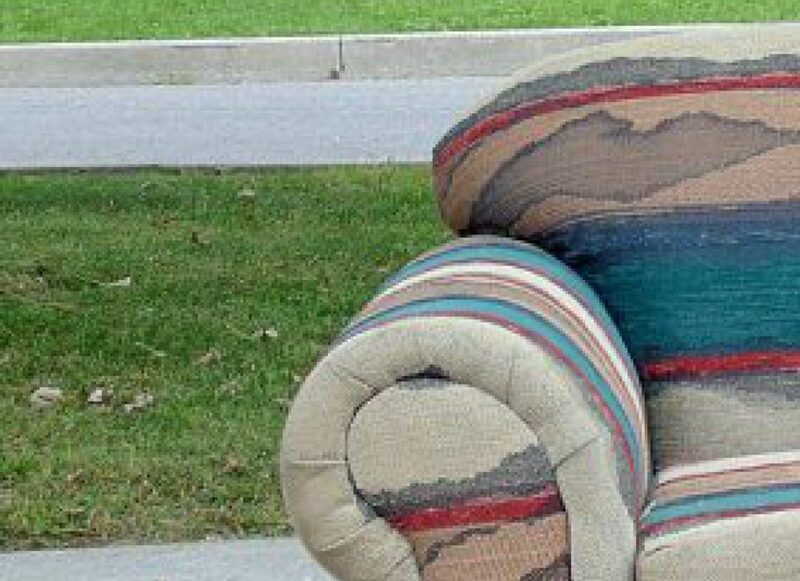 If you have a couch memory you’d like to share please leave it here and I’ll add it to the list, or assign it to an orphaned couch.